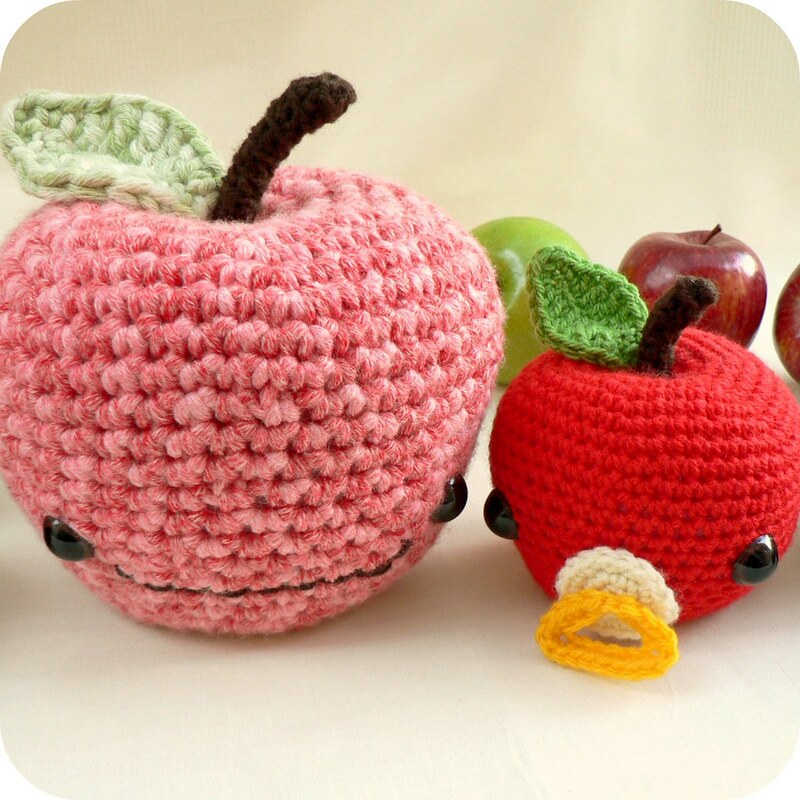 I’m back and have I been busy with knitting, crocheting, traveling and a bit of actual work! 😛 I’ve made three birthday gifts last month, two of which are for little ones. Richard also celebrated his 32nd birthday and we went away to the Blue Mountains for the weekend. But Richard got his birthday present months ago and he’s been wearing the handknit Asherton scarf almost everyday. My friend Linda and her son, Ewan, celebrated their birthdays a week apart and I didn’t know about it till the last minute. So a mad rush through Ravelry and I found a couple of easy patterns to work from. Do you remember the Luxury yarn range from Bendigo Woollen Mills that I knitted into hats? I had enough yarn left over to make the gifts for the mother and son. Pretty lace pattern with lovely details. 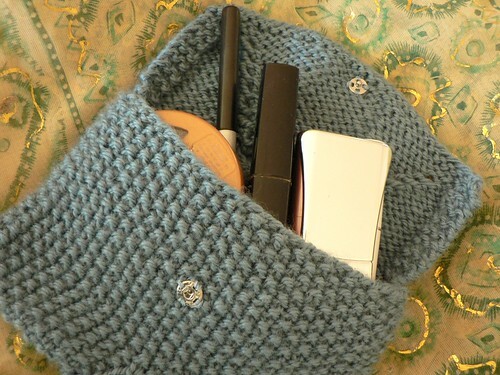 This makeup bag knitted up quickly. Perfect for a last minute gift. Mods: My attempt at a buttonhole failed, probably because I used smaller needles. So I sewed on snap enclosures instead. 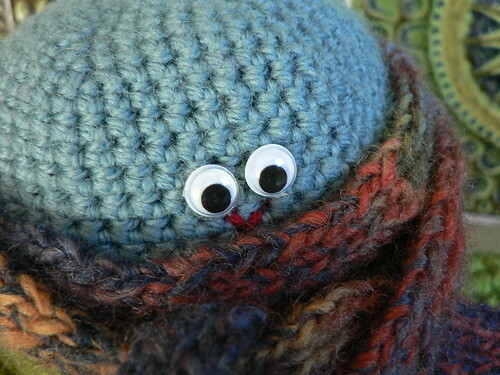 Yes, it’s an amigurumi octopus wearing a turtleneck jumper and a knitted scarf. It is winter here after all. 😛 Hehe… Richard was tickled pink when he came home and saw the silly octopus. But most importantly, I’ve been told that two year old Ewan likes it. Success! 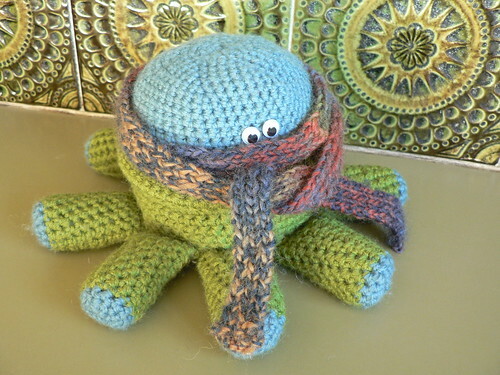 Mods: Switched between blue and green yarn (held doubled) and crocheted with 4mm hook to create octopus’ jumper. Simple rib scarf knit with 3.25mm needles. 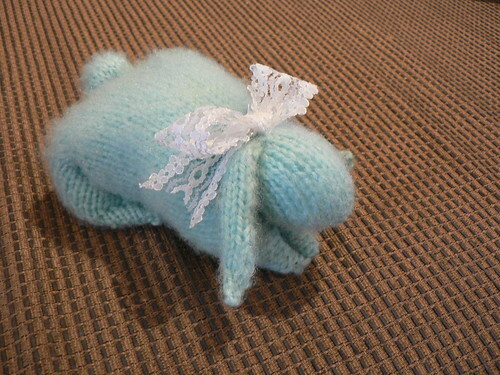 This bunny is for a special one year old girl we have yet to meet. When she was born, I knitted her a tomato baby set. We had to miss her first birthday party cos we both had colds. Can’t take a risk with the H1N1 virus going around. 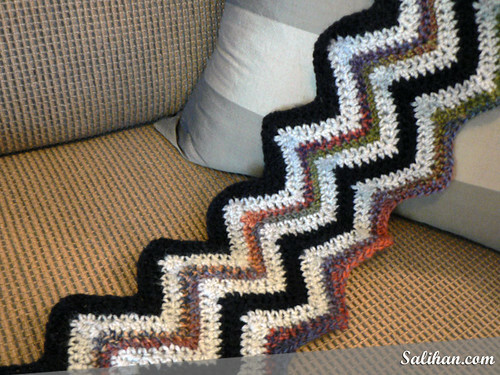 🙁 Anyway, if you can knit a square, you can make this. 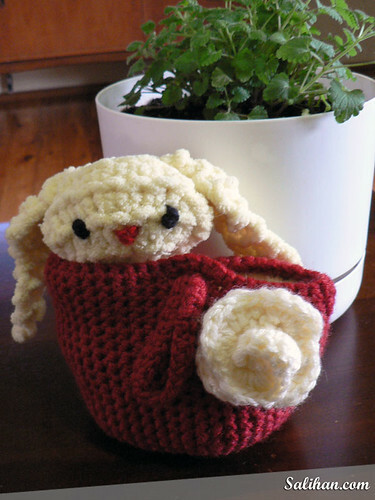 A little bit of clever sewing pulls this bunny together. Yarn: No idea. Didn’t have a ball band. Mods: Made floppy ears and added ribbon for a bow. That’s all for now but there are more FOs (finished objects) to come, plus travel photos. Thanks for dropping by today! Happy New (Financial) Year! 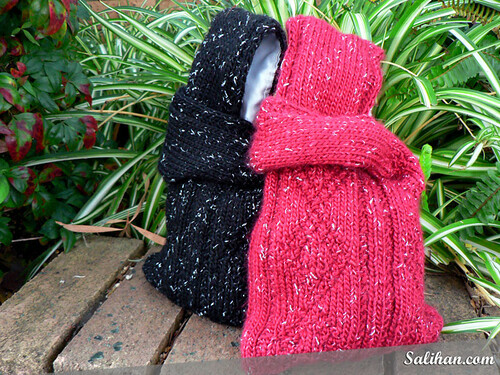 I knitted the Knitting Needle Knitting Bag (free pattern) back in 2007 and modified it to exclude the knitting needles and made a single shoulder strap instead. After several uses, I found the opening to be too tight, the strap just a little too long and the lining, which was made from an old pillowcase, was just not firm enough. It laid unused under a pile of bags in my wardrobe for many months until recently when it was unearthed during a wardrobe clean out. I wanted to bring the bag back to life. I just hate holding on to things that do not get used for one reason or another. 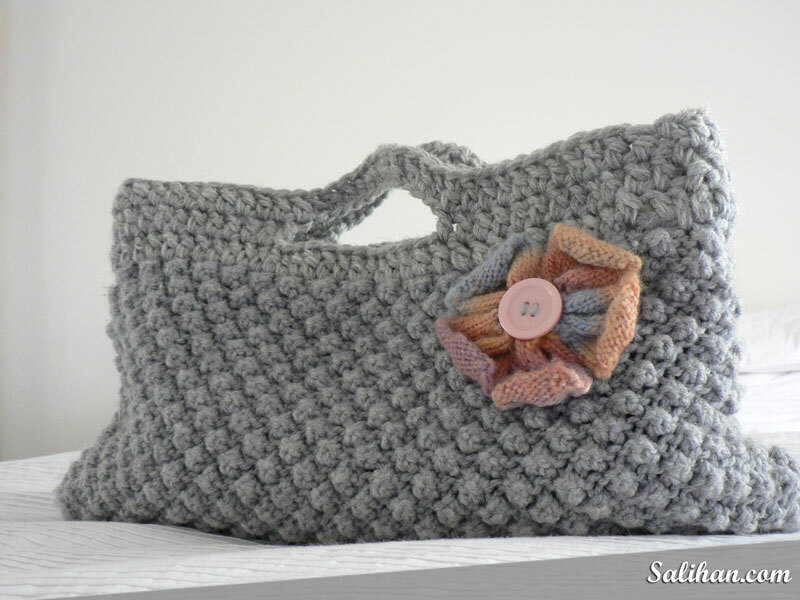 With my recently acquired basic crochet skills, I wanted new handles similar to the Buttonhole Bag and to also re-line the bag with stronger fabric. First and foremost, I had to strip the bag of its handle and lining and start fresh. I double stranded grey 8ply yarn and used a 4.5mm crochet hook. 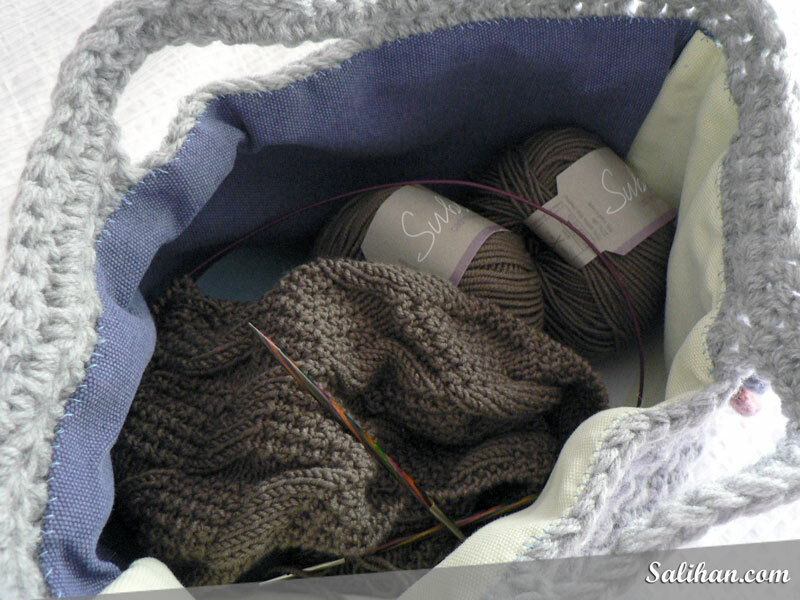 I double crochet along the opening of the bag . I counted the number of stitches I had on the front of the bag and divided it by 3, which turned out to be 13. On the next row, I double crochet 13 stitches then chained 13 stitches. I rejoined on the 27th stitch and double crochet to the end (side). I continued around the back of the bag in the same way. On the third and final row, I double crochet all the way around and bound off. New handles done! Next, to the lining. I value “fancy” lining when I buy a nice bag but I’m too lazy to fuss around when I have to sew it on myself! I had an old panel curtain which I wanted to recycle. So I killed two birds with one stone and lined the bag with it. I basically laid the bag down on the fabric and cut the fabric to twice its size to cover the front and back. Even though the curtain was made of heavy upholstery fabric, I wanted it to be even stiffer so that the bag won’t flop around. I ironed on interfacing onto the fabric to achieve this. I then folded the fabric in half with right sides facing, pressed it and machine sew the side edges. 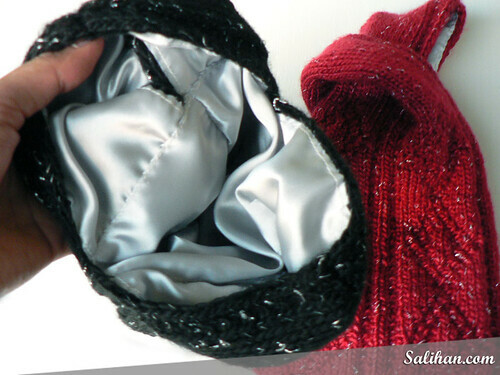 I fold an inch seam right around the top of the lining and pressed the seam flat. I placed the lining into the bag and hand stitched the top of the lining onto the bag. 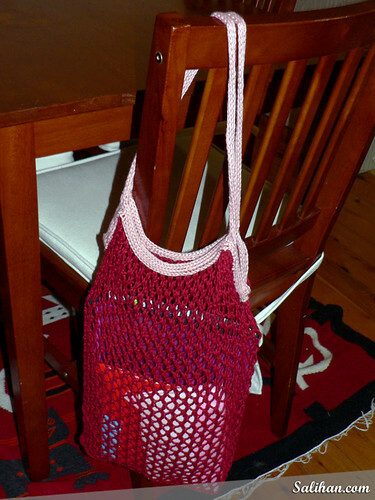 If you want to learn how to line a bag properly, Futuregirl has a good tutorial on how to do it on her website. And now the bag can stand/sit on its own and looks pretty cute I reckon! Since I haven’t been eating in school during my breaks, I have managed to churn out quite a number of gifts for Hari Raya and birthdays. My hands and mind kept busy whilst distracting me from food. 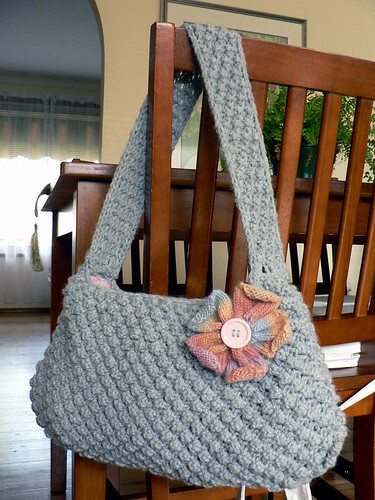 I’ve knitted and crocheted bags for little people and taller ones too. One of my old school friends found me on Facebook and we picked up quickly as if the decade hasn’t passed. 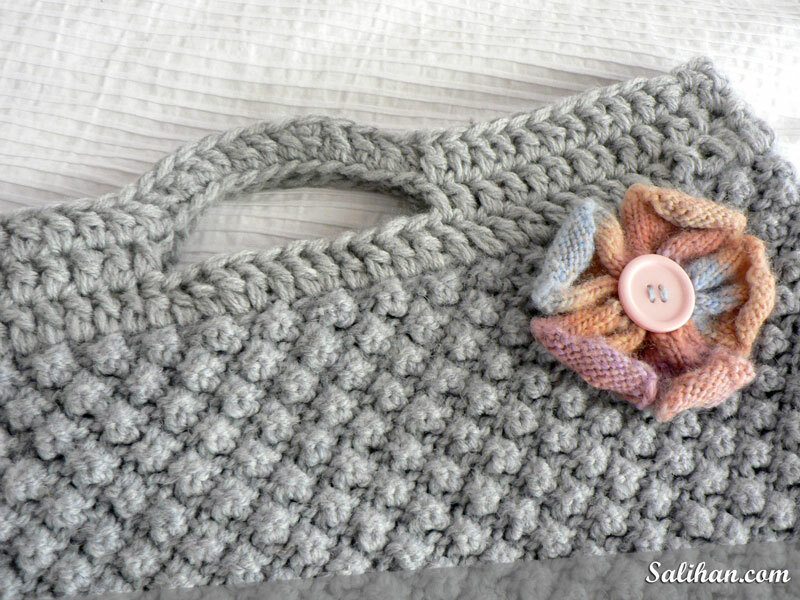 She saw the things I made from my blog and ‘ordered’ a little handbag for her 17month old daughter. I didn’t accept any payment for the bag but requested that she made a donation on Richard’s and my behalf to any charitable organisation, which she gladly did. 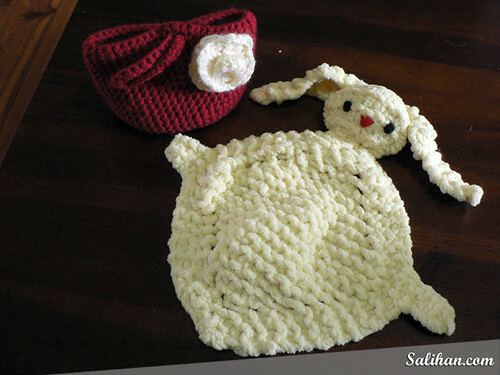 I crocheted this pretty little bag and knitted up a bunny buddy to go with it. 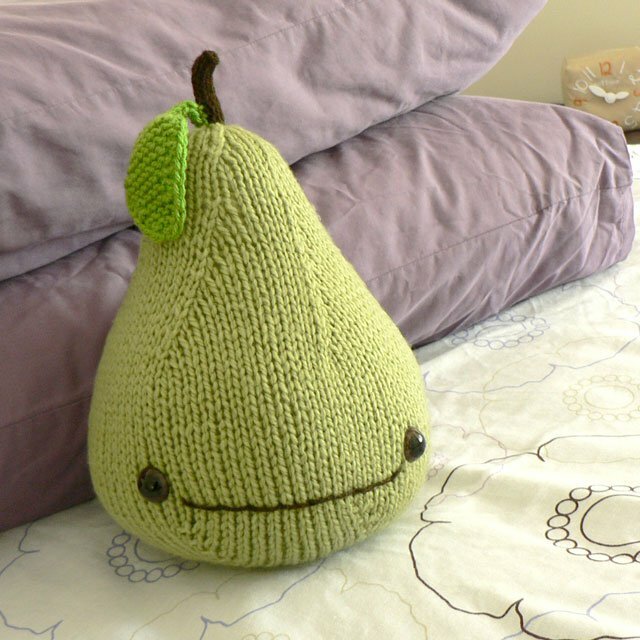 It’s such a quick crochet and absolutely adorable I think. I’ve been told the girl carries it everywhere, even to bed! I haven’t made anything for my two best friends before, Radiana and Dee. I was always too busy with other things and I thought it was high time they both got something special from me. I knitted them a Square Cake bag each, just in time for Hari Raya. I think the bags look very festive with the silver thread through the yarn. 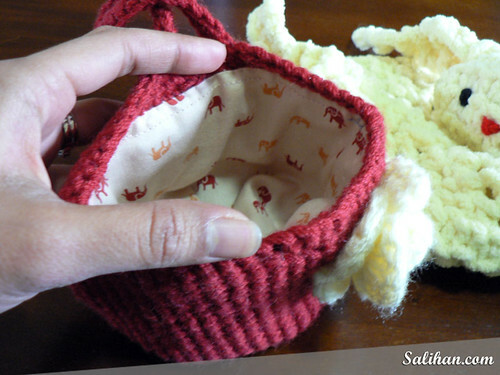 The only modification I would make to it when knitting it again is that I will definitely make the handles longer. Maybe an extra two inches to one of the handles. I found it a little too short to fit my hand through it comfortably. 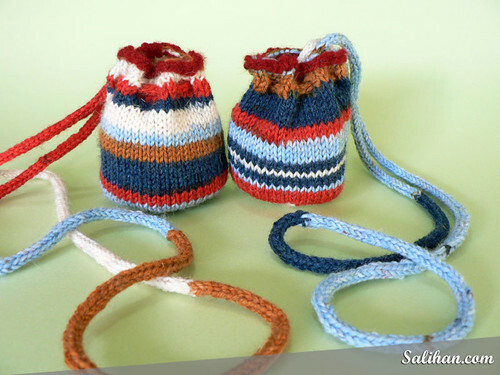 I also knitted two little Amulet Pouches for two special girls, Rachel and Georgia. Their my friends’ daughters who celebrated their birthdays in September. I’ve got winter blues. The world seems dark and dreary and COLD! 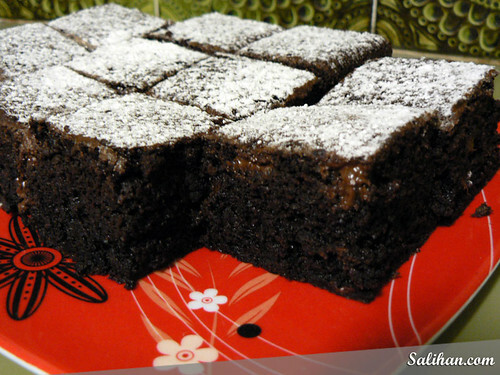 So I baked chocolate brownies to bring to work the other day cos we all need a little perking up at the moment. I can’t believe how soft and moist the brownies turned out and the recipe is simply from the side of the Nestle baking cocoa tin! 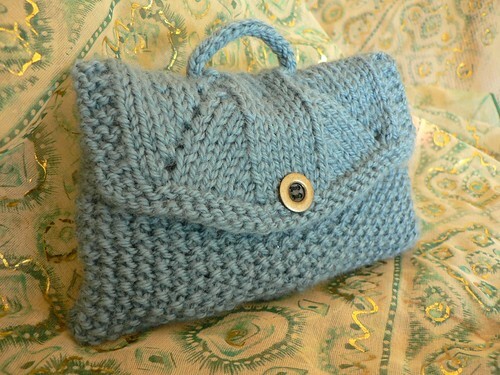 AND I knitted myself a new school bag to tote my stationery from class to class. It’s bright red and it sure makes me smile when I see it sitting at the back of a chair. The classroom suddenly doesn’t feel so dull and grey. I’m off to crochet a blanket to keep me warm! Taaa!